Fax numbers as electronic addresses: When you open the Address Book to address an email, you will see two entries for any contacts for which you have both an email address and a business fax number. If you’re at all like the CEO of my company (or any other rational human being), you’re asking yourself “why on earth would I want to send an email to a fax number?” Unfortunately, this behavior is by design. It is intended to make fax numbers “first class” electronic addresses for fax-server/unified messaging scenarios. 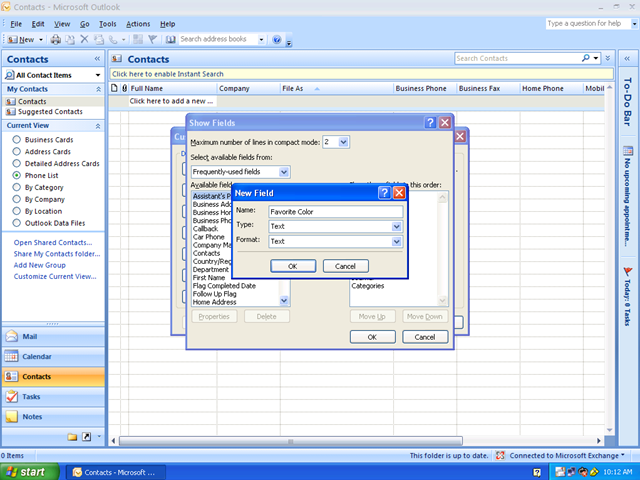 It is hard-coded into a DLL for Outlook and cannot be turned off or changed. The only real workaround is to put an F or “Fax” at the beginning of each fax number – the alpha character(s) prevent Outlook from recognizing the contents of the field as a valid fax number. You could also store fax numbers in one of the other phone fields, as “Business Fax” is the only field that comes in for this special treatment. Megaweak. You know that drop-down of cached email addresses that you get when you start typing in the “To” field? That’s populated from an NK2 file that stores addresses that you’ve either typed in or selected from “Contacts” or your Exchange OAB/GAB. The thing is, when you select addresses from your Global Address Book, they’re not stored as regular SMTP addresses in the NK2 file. Instead, they’re stored as Active Directory addresses pointing to the user object in AD. The CN at the end of the address is a GUID-type string. And guess what? Outlook uses THAT CN as the search term when populating the drop-down. So, for instance, “Alisa Hernandez” shows up when you type a “b” because her GUID starts with a B. Awesome! Office 2010 has a “compatibility issue” with Type 1 Helvetica fonts from Adobe. Specifically, touching anything in Word or Outlook with text formatted with these (INCREDIBLY COMMON) fonts will cause a massive insta-crash, every single time. Supposedly this issue will be fixed in SP1. In the mean time, there’s a registry hack that will prevent the crashes. Open HKLM\Software\Microsoft\WindowsNT\CurrentVersion\FontSubstitution and delete the key that lists a font to substitute for Helvetica (usually Arial). My feelings about these issues could best be summarized as “meh”. 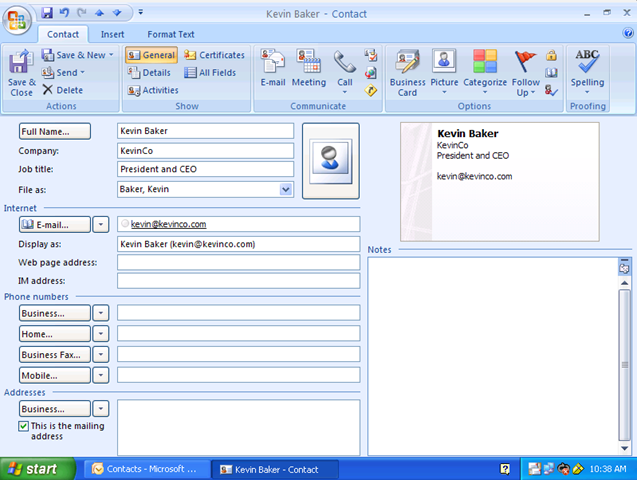 A friend of mine wrote to ask how you can add custom fields or attributes to your Outlook 2007 contacts. I’d never tried to do that before, so I fired up Ye Olde Virtual PC to find out (I’m running the Office 2010 technical preview on my laptop, and Outlook is considerably different). 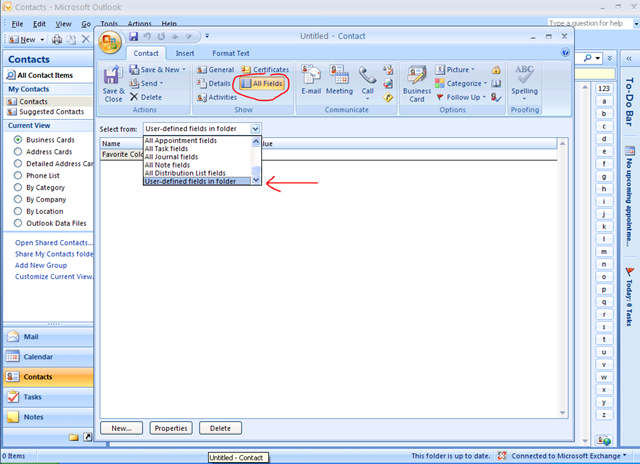 Open Outlook, go to Contacts and select the “Phone List” view from the list of views on the left-hand navigation pane. Here you can define your custom field with a name (Favorite Color in my example), a data type (like text, numbers, currency, etc. ), and a format. Do your thing and then click OK three times. You’ll be back in the Phone List view of your contacts. Scroll all the way to the right and you’ll see your new field as the last column. The nifty thing about the Phone List view is that it’s sort of like an Excel spreadsheet. You can edit your contacts directly without needing to “open” them one by one, which is handy when you’ve added a field that you may want to fill in for all of your contacts (like adding everyone’s favorite color). 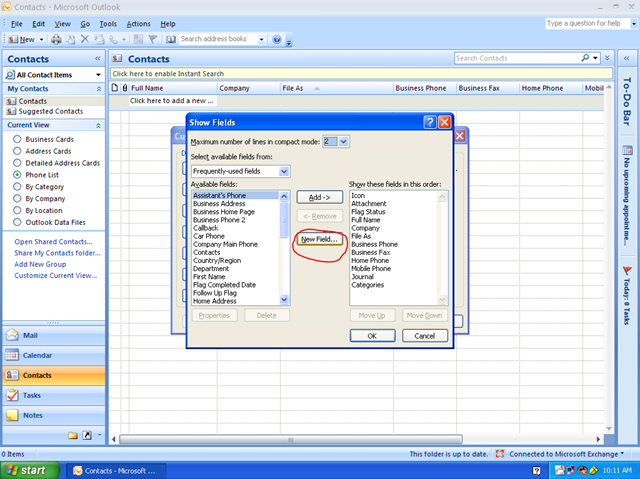 Click the “All Fields” button and select “User-defined fields in folder” from the Select From menu. 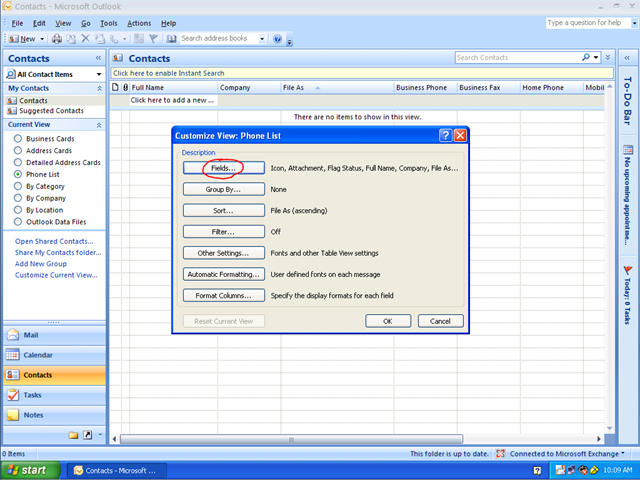 One caveat is that your custom field is only added to a specific contacts folder. Most home users of Outlook only have one contacts folder, and don’t really even think of it as such (because Outlook does such a great job of partially obscuring the underlying structure of your data). However, it is possible to have multiple contacts folders, and in that instance, you’d have to add your custom fields to each folder separately.